It was a lovely holiday – in spite of my slow start on preparations. I enjoyed three weeks of being able to spend time with family and friends and of having my son Alex home from college. I enjoyed giving myself the time I to cook and not write about it. I enjoyed the intellectual peace and quiet that comes from living in the moment. When what you do for a living is also so intimately connected to how you live your daily life and to how you give nourishment, and yes, love to your family and friends, well, it’s good to be able to separate them now and then. Last week, as I eased my way back into what has become my life-work dance, I started testing recipes again. I also made very simple dinners at night (grilled fish, chicken, and brightly flavored Asian stir-fry) because that’ s all we were really hungry for (a direct result of all those rich holiday meals). But this week after Alex left home to go back to school, the three of us who remained all needed a bit of comfort. I made a favorite soup that the four of us had always enjoyed together on cold winter nights. It did the trick. Steak and Potato Chowder (from The Gluten-Free Good Health Cookbook) is hearty comfort food. 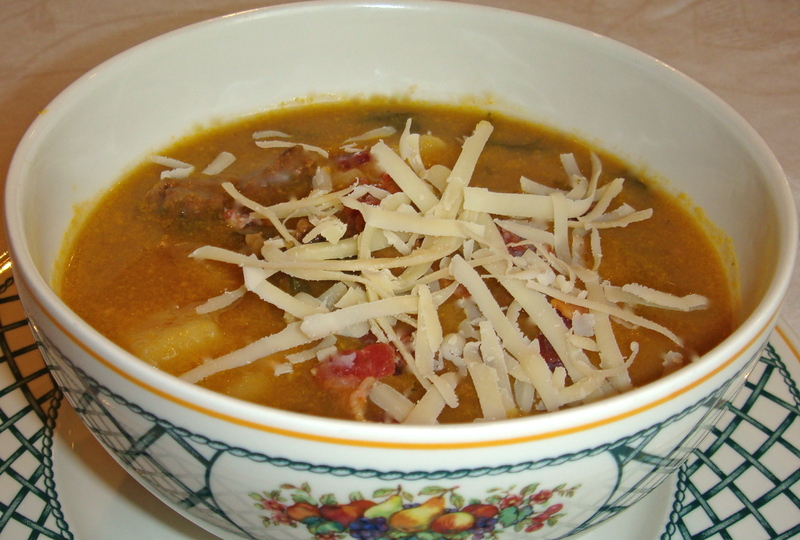 It combines sliced steak and potatoes in a rich, flavorful soup. The secret ingredient is a Creamy Beef Soup Base (also from The Gluten-Free Good Health Cookbook) that lends to the hearty richness without even a hint of cream. I like to sprinkle crumbles of bacon and shredded Gruyere cheese over the top – for a little added decadence – before I take it to the table. And I always serve it with fresh, hot gluten-free Buttermilk Biscuits, which you should do, too, if you decide make the chowder. I like to use my rich, creamy bases in order to quickly create a large variety of fragrant soups (I make a chicken soup base as well). The sautéed and then pureed vegetables in the bases add complexity to the flavor, good nutrition, and a luscious, rich thickness (they can also be used to hide vegetables from picky eaters). All you have to do is add more broth (to the finished base), raw or cooked chicken or beef, vegetables, herbs, spice and potatoes, noodles or rice,whatever you like, and voilà! Top off your creation with a touch of wine, sherry, or cream for a bit of elegance. You can also make the soup bases ahead of time and then store them in the freezer to pull out at the last minute. Of course, you can always just make them when you need them, like I did yesterday. But, thinking ahead, I made a double batch. In a week or two, I’ll be able to make something else to bring to my dinner table. I was thinking maybe a beef and shitake mushroom soup with gluten-free soba noodles……….. Combine sliced steak, garlic, thyme, balsamic vinegar and parsley in a medium bowl and mix well. Cover with plastic wrap and refrigerate overnight or at least 6 hours. Cook bacon over low heat in heavy large saucepan (6-8 quart) until crisp. Remove bacon pieces and set aside in a small bowl. Drain all but 1 tablespoon fat from the saucepan. Combine Creamy Beef Soup Base, beef broth and Worcestershire sauce. Add potatoes, cover saucepan and bring to a boil; reduce heat and simmer for 12-15 minutes, until potatoes are just tender. When potatoes are tender, add steak to broth mixture and simmer 2-3 minutes more until steak is cooked. Add freshly ground pepper and salt to taste. Ladle chowder into bowls and sprinkle with bacon and Gruyere cheese. Chowder can be made ahead and stored in refrigerator for up to three days a tightly sealed container. Leftovers can be stored in refrigerator for up to three days. Rewarm over medium-high heat. Heat 1 tablespoon oil in a large heavy saucepan over medium high heat. Add onion, carrots and celery and sauté until lightly caramelized. Add broth, turn heat to high and bring to a boil. Cover pan tightly, reduce heat to low and simmer for 15 – 20 minutes, until vegetables are very soft. Pour broth/vegetable mixture into blender and puree until smooth and creamy. Pour pureed mixture back into the saucepan or a storage container; stir to combine. Season with salt and freshly ground pepper to taste (Can be made ahead; keep covered and refrigerated). Add about 1 teaspoon dried herbs (or to taste) while broth is simmering: basil, thyme, oregano. Or add 1/4 – 1/2 teaspoon spice (such as cumin, curry, chili, Chinese Five Spice Powder) while onions cook, if desired.